Music Thing: Ever heard a recording and thought it was a live band? Ever heard a recording and thought it was a live band? A lot of it's the feeling. There's an actual tangible pressure, especially from the drums. Also, the live drums will have a much wider frequency range, and won't have compression, and so on. Basically I think it's the drums which are more responsible for the difference. I've yet to hear a recording of drums which sounds like the real thing, while everything else is basically passed through a signal chain akin to recording/playback anyway. I HAVE entered venues where the band was using electric drums and I thought it sounded like a CD. So I'm pretty sure live drums are the main telling difference. Can't say I've ever mistaken a CD for a real band either. Could it be down to SPL? also, you can tell if a band is playing in most pubs I know of because you can generally hear the drummer from outside! When all musicians are recorded in real live condition, that means all playing in the same room & indeed when a minimum of compression is used you can get similar results. Of course, this needs a minimum of recording skills. Also, if the recording room has similar dimensions than the listening room, that might be very helpful. I agree with Fluffy about the drums. In the beginning of that Johnny Cash biopic a couple years ago, where Cash is backstage at a prison show fiddling with a table saw, you can hear the band out on stage vamping while Cash emotes at the camera. It affected me physically/emotionally exactly the way a live band does. Of course I already knew it was a movie, but everything below the conscious level was fooled anyway. Part of it may have been that you never hear a band that way, muffled through a wall, except in real life. But, I think somebody did a gorgeous job recording that band, and the movie theater sound system had the frequency range to make it work. glad that you like our photo! 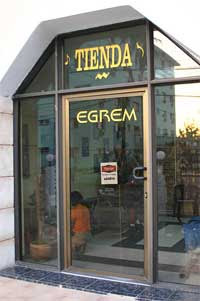 It is actually the photo of Egrem Music Shop which sells the Egrem CD in Miramar, Havana, Cuba. The recording studio is at the adjacent building, which is not in the picture. I was at a wedding recently and thought to myself 'Geez, that's an awesome stereo. It sounds like there actually IS a string quartet here.' Turns out there was a string quartet just out of sight at the back of the church. So it's possible to tell even without drums. Bum notes are often a giveaway. slightly a side issue, however I'll chuck it in. There is (was?) a restaraunt in Clapham called 'tiger lillies'. The chefs cooked up what you selected in woks on gas powered oil drums. Lots of metal slapping sounds come from that. I noticed the place had an incredible audio atmosphere. Also the hubbub of the diners chat, forks and table noise. felt like exciting joint to be in. One day I was the first evening customer and got chatting to the head waiter. He pointed out that just below ceiling height they had (piezo?) mics, the ones realistic/tandy used to do , the square black plate that you stuck to the wall. Ambient mics people used to call em. What the place did was mix the sound of the room from those, back into the room through the soundsystem. Well below feedback level. This would totally excite the atmposphere and bring out the metallic clanging of the chefs. Really worked. Diners would almost compete with their own voices, though they didnt know it. I asked the guy did they ever record the sound and use it when the place was not so full. Waiter said once he did. was pretty funny. i suspect it's a combination of types of instruments (acoustic helps) , recording situation (importantly, as purple said, similar room sizes) and most probably psycho-cultural factors like knowledge of music and expectation. if these people had been walking into a launderette, they wouldn't think that the buena vista lot were playing around the corner...(nor a church organ unless it were a church). and let's face it, given the sound in most live situations, to mistake a recording for the real thing, it would have to be a pretty dire recording. Supposedly the BVSC album was recorded and mixed without or with very minimal use of compression and equalization. There is something to be said for mixing without concern for competing in the loudness game. It creates an atmospheric experience that attempts to place you in the room with musicians, instead of trying to push the instruments through your ears. I'd love to see the mic setups for that album. A good jazz recording, classical recording, or a nice natural recording like BVSC, really tries to mix everything how it would sound if it were in front of you. the drums arent spread throughout the stereo mix, they have simple miking and are placed somewhere in the middle. if it's a good performance, no overdubs get used and the whole group can be recorded in one room. you won't really find a rock or pop recording like that. in those, the vocals are up front, the drums and bass are underpinning the rest of the mix, and there is significant production and engineering done to every track. this is not anything new of course, it's been done since the advent of mixing (1940's?) and has little to do with the loudness issues of the last 20 years. Another factor which might creat this illusion is the wide placement of a PA in a place like a bar or restaurant. Non-standard placement of the speakers might create the illusion that the instruments are bouncing around from some band around the corner that you can't see. This might be true of any 'more natural' recording, even a rock one. I've heard this illusion before, though I can't place the exact places or recordings. Elevated, decent PA speakers, far apart from each other, like they have in restaurants, creates a stereo so wide it can really mess with your head. (continued) and of course, the way live performances usually sound - if you see a live performance that isn't at a Huge venue, you hear the real band with some degree of reinforcement. You'll hear all the instruments in a natural place, with kick, snare and vocals really pushed up to give you a more listenable group. (we're talking about rock and pop etc here). So if you put a natural recording, which would be natural placements of instruments with some unnatural reinforcement, in a big echoey room like a bar or restaurant, it might create that same live sound you are used to. I play techno from a laptop, and sadly this happens to me all the time when I play live. It's all about "room sound". The Buena Vista Social Club CD is the perfect example of this. The closer to an instrument a micrpophone is placed, the more instrument than ambient sound is picked up. Also, the closer the mic is, the less "natural" the sound is, as no one listens to an acoustic guitar with their ear 1 foot away, or to a trumpet with their ear 1 foot away. The sound of an instrument really develops over distance. An acoustic guitar through a piezo or similar pickup will generate frequencies down to 30 Hz in some cases, yet when you sit out in front of an acoustic guitar, you'll NEVER hear those frequencies -- you'll hear the "natural" sound of the instrument, along with the sound of that instrument's sound bouncing off all surfaces in the room, and becomes really rich, sonically, in a pleasant way. This is room sound. What I perceive as Ry Cooder's school of thought: let the music live and breathe; capture the music and vibe the musicians are creating. The opposite school of thought: close mic each individual instrument in an isolation booth for maximum control to "Sculpt" the sound afterwards. I prefer the former, because if the performance and vibe are good, the sonics will all come together as they should! Don't know if the BVSC-recording had been mastered this way. I have been fooling myself with the Zoom H4 recorder. I had recorded an acoustic session in my flat and at some point my phone was ringing. When I heard that recording the other day again, I immedeately went to the phone when the ringing sounded. Ha! After a lifetime spent in various acoustic environments we all become unconsciously adept at sensing when a sound is _right_ in a particular acoustic space. If an instrument has been recorded in a space with a large reverb (church etc) it's always going to sound 'big', even if the recording is played in a small room. Your ears/brain pick up on the subtle clues (early reflections etc) to determine the immediacy of the sound (part of our evolutionary fight/flight reflexes). Our ears are also exceptionally good at 'localising' audio...i.e. telling from what direction it comes. This is due to the way soundwaves 'bend' around our heads (the head related transfer function HRTF). These conscious/unconscious clues allow us to determine if the sound in a venue is 'live' or not, generally with a high degree of accuracy based on our past experiences of similar spaces/sounds. Sometimes the recording may have been done in a space similar to that in which it is played back, using appropriately placed speakers and this may be what leads to the real/recorded confusion. The nature of modern recording (mostly stereo) also means that what we hear on CD etc is only an approximation of a real 3D acoustic environment and our ears can often tell the difference (check the difference in headphones between a standard stereo recording and a binaural one...you'll find the binaural one much more 'real'). I liked your post, but I was looking for more guitar videos for lessons.